After hiking in Triglav I stopped in Ljubljana, the capital of Slovenia for five nights. I met other travelers in Metelkova, joined a Free Hugs party and had one of the most extreme CouchSurfing experiences ever. Ljubljana is nice and small for being a capital. The castle hill overlooks the city center which is crossed by the Ljubljanica river. Many buildings date back several hundred years but the center got its current look during the first half of 20th century, largely from the drawing board of one architect, Joze Plecnik. Stylish cafes populate the riverside which also has plenty of spots where street artists play music and show their skills every day. Only about a kilometer away there's Metelkova, a group of buildings squatted 15 years ago with funky art galleries, graffiti all over the walls and people hanging out drinking beer every night. I had already walked the usual touristic trail with my mother and brothers two weeks earlier so this time I spent more time meeting people in Metelkova. I cooked with a group of Finns who were traveling from a festival to festival in an old campervan and listened to music with two French guys from Lyon. And in Metelkova I also met Andrej. Andrej was the most active CouchSurfing member in Ljubljana and didn't have any guests at the moment so he readily invited me to his house. I was staying in a hostel but moved the next day. One day later an American guy and two Canadians arrived, also bringing in as a surprise four Danish girls who had been in the same bus and didn't have a place to stay. Andrej picked up everybody from the city center in his car and gave a city tour in the evening while still keeping his building maintenance business going at the same time. Laurent and Gabrielle, the two Canadians got an idea to have a Free Hugs event on Saturday. The idea is simple: make signs which say Free Hugs in English, the local language and possibly other languages, smile and give a hug everyone who is willing to accept one. We met in the city center and started hugging strangers under the covered sidewalk by the market and on Preseren square, in the middle of rain. After two hours everybody was wet and happy. While giving hugs we also met a group of French students who were looking for a place to set up their tent. They didn't have to: Andrej invited them in to have 12 guests in total and the day ended in a drinking party in his house 8 km from city center. On Sunday morning everybody went in their own directions. I had planned to hitchhike towards Bosnia, but late Sunday morning apparently wasn't the best time for that. After a couple of hourse of waiting I decided to take a train to Zagreb, Croatia and spend the evening there. Triglav national park in Western Slovenia has beautiful alpine scenery, but it is also a kind of open air museum of the First World War. I did a five day trek in the southern parts of the park. After my sightseeing tour in Venice I spent a couple of relaxed days in Udine, Italy. My CouchSurfing host Katia introduced me to the restaurant and community Casa del Campo, where we spent late evenings in a homely atmosphere. I also bought gas for my gas cooker, stocked up on food supplies and spent quite a few hours in front of Katia's computer reading and writing emails. Then I took a train further east to Cividale, hitchhiked to Kobarid, Slovenia and started walking from there the following day. Climbing with an overloaded backpack wearing sneakers instead of proper hiking shoes was slow. I only made about 1000 meters uphill during the first afternoon. It started raining but I found a small cottage which was apparently sometimes used by shepherds or forest rangers. The door was locked but there was a perfect place for my sleeping bag on the terrace. For a while just before the sunset clouds gave way to the sun which illuminated beautifully the village below in the valley. In the morning two men arrived with portable mine detectors. They told that old ammunition and land mines from the First World War still remained in the area. Further up the bloody history of the region became more and more evident. On the mountain ridge near the Krn peak there was a monument, rusty shells set up for display and old barbed wire here and there. 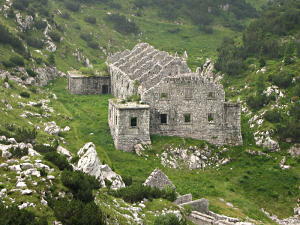 Inside the Batognica mountain criss-crossed a network of tunnels which had been used as bunkers and ammunition storage. Italian and Austro-Hungarian armies were fighting against each other and eventually the whole peak of Batognica was blown off, making the mountain some 50 meters lower than it originally was. I only went a couple of dozen meters inside the tunnels but a local told me that some hikers had even got lost in them. I climbed on the top of Krn which offered a superb view in all directions, particularly towards the Krn lake and northern parts of the park. The peak of Triglav mountain, where the name of the whole park comes from, was mostly hiding behind the clouds so I'm not sure if I saw it or not. After taking some photos I descended to the Krn lake and spent the night in the nearby mountain hut. Following morning I continued north-east towards the valley of Triglav lakes (Dolina Triglavshkih jezer), also known as the valley of seven lakes. The Komna highlands had more remains from the war times. Walls of old stone buildings stood still strong in the valleys, looking like they can still resist at least a few more centuries. Roofs and windows were gone, grass and flowers were pushing out from everywhere there was even a tiny patch of soil. Hiking paths followed old wartime roads. The paths had clearly been constructed with more effort than a regular hiking trail would have been, but the last vehicle had passed long, long ago and now they already blended nicely with the nature. Camping was forbidden in Triglav, the only officially allowed places to stay overnight were staffed mountain huts. I personally think camping in national parks should be allowed or there should be at least some designated campsites, to make nature accessible to everyone, with or without money. Of course it would have been easy to find nice hidden spots for wild camping, and the hut personnel didn't seem to be too strongly against it. When they asked if I'd like to stay in the hut, and I replied "Oh, I'd prefer to sleep outdoors :)", they'd smile and answer something like "Ah, we know, but you'll have to hide from the Triglav men." Then they'd put me up with a group of scouts or otherwise their most modest offering, two times out of three with alpinist discounts although I didn't have any club membership card to present. Also otherwise the people were very nice and friendly, so I stayed at the huts and didn't camp. I had originally intended to continue north-east, near the highest peak (Triglav) and descend on the other side, but due to rainy weather I changed my plans. From the hut of Triglav lakes (Koča Pri Triglavskih Jezerih) I headed south-east, coming down at Stara Fuzina. There I washed off the sweat in the Bohinj lake and hopped in a bus to Ljubljana, the capital of Slovenia. The bus stopped in Bled, which is famous for its scenery. After the real mountains it failed to impress me, one hour walk around was enough of Bled.